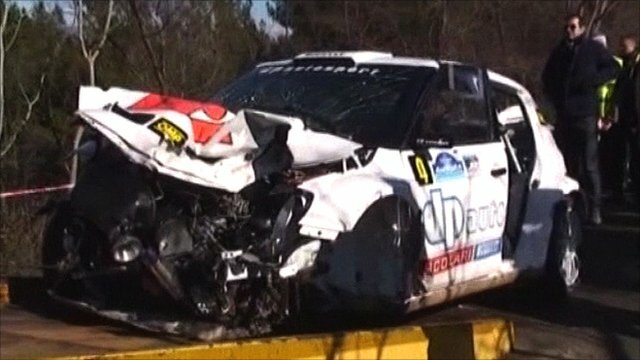 Robert Kubica's Formula 1 career is under threat after his right hand was partially severed in a high-speed rally crash in Italy on Sunday. He also suffered arm and leg fractures after his car hit a church wall. Kubica, who drives for the British-based Renault F1 team, had seven hours of surgery after he was airlifted to a hospital near Genoa. The 26-year-old Pole looks likely to miss the entire 2011 season, which starts in Bahrain on 13 March. Initial reports suggested he was in danger of losing his hand, although those fears were later played down. However, Professor Mario Igor Rossello, a specialist surgeon involved in the lengthy operation, said that it was too early to accurately assess the long-term implications of his injuries. Rossello told reporters he was "moderately satisfied" with the operation to rebuild the hand, but said that it would be several days before doctors could determine whether the hand would be "able to return to full function". He added: "The danger is, in five-seven days you can have vascular problems, and we could do surgery again to solve these problems." When asked what the best prognosis for recovery would be, Rossello replied: "One year. One year is the best provision." The doctor said he expected the driver to recover "enough functionality for him to resume his activity." He was operated on after reportedly being trapped in his car for more than an hour while specialist cutting equipment arrived. 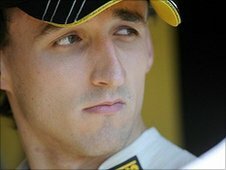 Kubica also needed surgery in 2003 after a serious road accident as a passenger that left him with titanium bolts in his arm. Reports suggested that Kubica was 4.6km from the start of the Ronde di Andora rally on Sunday morning when his Skoda Fabia crashed. His co-driver Jakub Gerber escaped from the wreckage unharmed. It is understood a crash barrier penetrated the footwell of the car. Two-time world F1 champion Fernando Alonso was reportedly among the visitors at hospital as leading figures in the sport supported their stricken colleague. As the operation took place, Kubica's manager Daniele Morelli told reporters at the Santa Corona Hospital: "Surgeons are trying to re-establish the functionality of his right hand." He added: "Robert is very strong and he will do it." The former driver for the BMW Sauber team regularly competes in rallies and was driving a week after a successful testing session in the new Renault car in Valencia , ahead of the season's opening grand prix in Bahrain. Kubica had been due to lead the Renault team alongside Russian Vitaly Petrov, who has a long-term contract after signing for the 2011 and 2012 season during the winter. The reserve drivers for 2011 include Bruno Senna - who raced for Hispania last season - and Frenchman Romain Grosjean, who drove for Renault as a replacement for Nelson Piquet Jr in 2009. It is likely that either of these drivers will be called up for the second pre-season test which starts in Jerez on Thursday. Kubica was an impressive performer last season to finish in eighth position in the drivers' table, securing second at Melbourne and a third in Monaco and Belgium. The Krakow-born star also suffered a bad crash at the Canadian Grand Prix in 2007 and was forced to miss one race. He returned to the same track the following year to claim his first Formula 1 victory. Kubica's F1 colleagues have been sending messages of support. Britain's former world champion Jenson Button, who drives for McLaren said on his Twitter page: "Shocking news about Robert Kubica. I wish him a speedy recovery." Williams driver Rubens Barrichello tweeted: "I would like to ask you for your best wishes to Kubica. He is being operated right now. We all like him and he deserves all the best." Heikki Kovalainen, of Team Lotus, said: "All thoughts on Kubica tonight, he's a great guy, lets hope operations go well and he makes full recovery." Sebastian Buemi, of the Torro Rosso team, told his Twitter followers: "All my support to Robert Kubica. I am with you man"
Can Kubica make successful comeback?